Ever wonder about how planes are able to fly despite being so large? Would you like to try flying a plane? Want to have FUN this Summer? Then join one of the Summer Day Camps at 7:47 Aviation! Are you between the ages of 9 and 15? Do you look up at the sky when you hear a plane? Then this Camp is for you!! 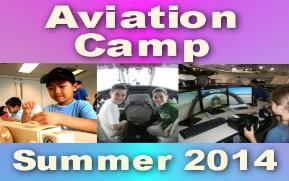 of piloting an airplane, THIS CAMP IS FOR YOU!! SOLO IN AN AIRPLANE !!!! life as a Pilot ..........TODAY! Are you, or will you be 17 or older this year? earn your private pilot certificate!!!! By the end of camp you will be a CERTIFIED PRIVATE PILOT! Copyright 2008-2018 7:47 Aviation, Inc., unless otherwise indicated. the air and let them have the experience of controlling the aircraft. Boost your child’s self esteem today with an Introductory Flight from 7:47 Aviation. Increase your freedom by earning your WINGS!